World Dryer Corporation to Pre-Vandalize Automatic Hand Dryers | Kris Johnson's Blog…sort of. In a press conference held Monday afternoon, a representative from World Dryer Corporation (a subsidiary of Carrier Corporation) announced that all automatic hand dryers produced by the company would be manufactured with pre-vandalized operating instruction labels. Vandal-hours the company hopes will be put to use creating new, original means by which automatic hand dryers can be defaced. Until 2002, when the company introduced the new pictographic instruction label to select markets, nearly every automatic hand dryer in every McDonalds, State Park and WalMart restroom was defaced in exactly the same manner; it is this standardized vandalism that World Dryer will reproduce. When asked whether automatic hand dryers featuring the pictograph-style instruction labels would be modified with text instructing users to “Push Button” and “Receive Bacon”, Tidwell responded in the affirmative, but indicated that such dryers would probably not be produced until early 2010. Shares of Carrier Corporation’s parent company, UTC (NYSE: UTX) closed at $56.11, down 0.23%, after the announcement. @Rachel — Thank you. My wife has informed me that automatic hand dryers in women’s restrooms are not as universally-vandalized as those in men’s restroom (I’m not surprised), so I suppose Mr. Tidwell’s defacement-proliferation figures are somewhat inaccurate. It’s about time some proactive steps were taken in this industry! 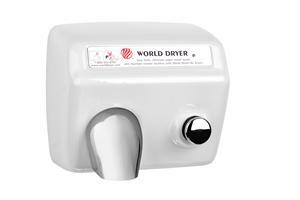 Congratulations to World Dryer for thinking outside of the cover. And nice writing! For other solutions, see Restroom Direct Hand Dryer Cover Options. @Chris Berl — I am somewhat astounded by the vast array of materials from which hand dryer covers—not to be confused with hand dryer cozies, which are always made of wool and knitted by someone’s incredibly bored grandmother—are manufactured; I mean, thermoset polymer? That’s some pretty serious stuff. Well, it sounds serious, anyway; I’m pretty sure Geordi fixed the Enterprise-D with a liberal application of termoset polymer to the warp-core containment something-or-others once. I am more astounded that you actually kept your eyes open long enough through the hand dryer cover guide to actually see the part about Thermoset Polymer. Most people nod off at “cast iron”. Yes – lots of different material for hand dryers – many developed specifically with vandalism in mind. None, before today, however, thought to thwart vandalism by pre-vandalizing. That is truly genius. What will they think of next, selling jeans with the holes in them already? Or intentionally wearing down the paint on furniture? @Chris Berl — As with any visionary concept, this must be utilized with caution and not to excess. I’d hate to purchase a new automobile (yes, probably another minivan) only to find that it arrived—fresh off the assembly line—with a deep key scratch across the driver’s side doors, sugar in the gas tank and four slashed tires.